Colleges and universities are increasingly capturing lectures and other instruction for a variety of applications, including distance learning in real time and downloads by students who want to review a particular class. Oregon’s Portland Community College uses videoconferencing endpoints already in select classrooms to produce five to ten minute lecture excerpts, such as a math class demo of an important equation. Distance learning at The Arkansas School for Mathematics, Sciences, and the Arts, is powered by Tandberg equipment. Drexel University, meanwhile, uses HD videoconferencing equipment to support classes that span its Philadelphia and Sacramento campuses. HD resolution also can help ensure the TEDx production quality that some faculty expect. Regardless of how schools implement it, the amount of distance learning is growing exponentially. 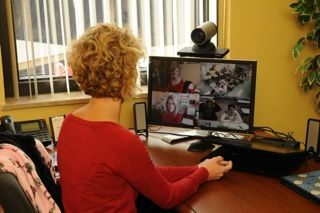 “UGA is installing more videoconference systems and sending classes to our remote campuses, especially in the sciences, medicine, public health, pharmacy and agriculture,” said Tom Beggs, classroom support coordinator at the school’s Center for Teaching and Learning, University of Georgia. The more content that a school makes available, the more valuable—for student and college alike—a content management system becomes.